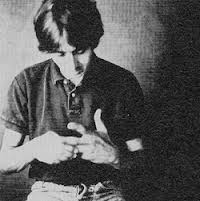 We shall get to a more in-depth proper blog on this in the future, but for now, as requested by some fans, here is a full written transcript of the 1988 BBC1 Richard Skinner interview with Mark Hollis discussing the then just released Talk Talk album “Spirit of Eden”. Also, included here are audio of the full album and the actual audio recording of the interview. Why not listen to the album whilst reading the interview, or, listen to the audio interview and then listen to the album in light of what Mark has said about it. (PS – I absolutely love the ending of this interview – he’s so refreshingly honest & disarmingly self-deprecating!!). RS: “Our guest today is Mark Hollis of Talk Talk, and I guess first of all we have to say, the new album has been a long time coming”. MH: “Yeah I would say it is, I would definitely say that. I mean there are a lot of references within this album to different things. And sure, that “Sketches of Spain” is definitely one important thing. MH: “Well I mean you see, in terms of the take, you see, the only way that a sort of take situation occurred, was just in the very basic laying down of the track where sort of like, you know, maybe three of us would just put the basis down. From that point onward, you know, there is no take. You see, this is the one reason why I don’t think an album, the way this is made, could have existed in an earlier time, because it is only because of the advent of this sort of digital recording technology, that you can get away with the way this album has been constructed, which is just that thing of giving people absolute freedom, being able to take the smallest amount of what they play, but not even necessarily using it where they did play it, you know, putting it elsewhere in the album and then you know, being able to make this very careful construction of arrangement but absolutely everything that is played is fresh and from that person. MH: “Sure”. “Well, I just think, you know, I’ve always liked the idea that things that oppose each other can co-exist, that’s all it is”. RS: “Yeah changed dramatically too, over the 6 years. MH: “Well all “Spirit of Eden” means to me, is it means two things within that same title. It means what is created and then, what has been destroyed. That’s all it means. Again it is this thing of two opposites co-existing. That’s why I like the title”. RS: “And it wasn’t cheap”. 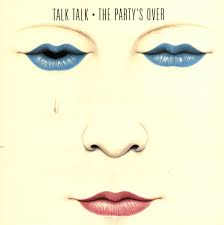 “Candy” is the final song on the tracklist of Talk Talk’s debut album, “The Party’s Over” and despite the internets best efforts to accredit the song to Burt Bacharach (more of which later), it was in fact written by Mark Hollis, lock, stock and shooting match. Originally demoed in June 1981, it was initially produced by Jimmy Miller and published by Island Music (one of a batch which were originally put together to secure a publishing deal). Here is a copy of the Demo track laid down in ’81. “… EMI signed them up and divined in their smart, smooth poptones the ideal undercard to Duran Duran, then the leading lights of New Romantic. With the release of an eponymous single, a shiny, synth-pop replication of the Duran sound, few imagined that this lot would be around for long, pre-destined to be ‘80s, one-off curios a la Living In A Box. The afore-mentioned illustrations were done by James Marsh (earlier art concepts had been attributed to Peter Saville). 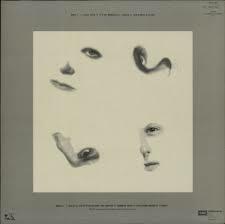 It was suggested by the band in January 82 that Saville was already working on the artwork for the cover sleeve: fortuitously though, a friendship between the band’s manager Keith Aspden and Marsh saw him being commissioned, and, such was the success of that collaboration, Marsh retained the commission for the duration of the band’s productive existence. “It’s meriting of an additional if not too further bruising a note, to add that Hollis’s lyrics reflect a general half-heartedness in Talk Talk’s debut debacle. 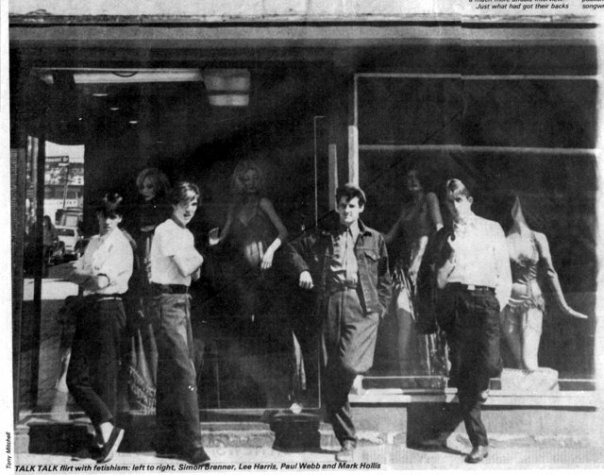 They are just not up to scratch for summer ’82, and I have to close by contradicting the pleasingly crass EMI handout and saying…this ain’t worth much, um, Talk Talk (groan groan)…” (Dave McCullough, Sounds, ’82). This is the man who has continuously cited Burt Bacharach and William Burroughs as his lyrical/literary influences. 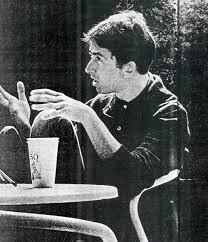 Again, and again in interviews, Hollis repeatedly reaffirms his admiration for the man who wrote “Anyone who had a heart” “The look of love” and “Only love can break your heart”. Of all the songs on the Talk Talk debut album, “Candy” is probably the closest in touching off that Bacharach influence. Emotive, sad, bitter, strangled. There is no way forward and no way back; no escape from this emotional entrapment. He knows he should move on, shed skin, but instead taps into ready made excuses to keep himself attached to the source of this pain. The vocal of this song is the key to it’s success; the power of Hollis’ inflections and intonations – where he stresses the words that he wants you to pick up on – is fundamental to conveying that depth of pained emotion. Underpinning this is the subtlety of the music – spacious bass, melancholic keyboard, looping electronic drum & synth, music with gaps (a nod to what was to come down the line). However, there is a quite surprising shift at 2.30 when we are suddenly thrown a marching drum segment normally not out of place in a piece of prog rock! Credit has to be given to Lee Harris here for spot on percussive interpretation. This unexpected sequence heightens the sense of frustration and strangulation. There’s almost a sense that the singer has found “his voice” but then, everything slips back into “the dark”. The song ends with trademark Webb bass and a final percussive flourish. It may be last in the line up, but it is certainly not least in quality or craftsmanship – both vocally and instrumentally. As we have already mentioned, the demo was produced by Jimmy Miller – however, EMI in all their wisdom brought in stable-mate Duran Duran producer Colin Thurston to produce “The Party’s Over”. A corporate error of judgement and another Duran connotation. It didn’t work, and had more negative consequences image-wise for a band as yet uncertain of their own true identity. Mark “I thought to work with someone that’d been involved in Bowie’s ‘Heroes’ had got to be good” said Mark, “it had great sound, great presence, great vocal, all that – but he tried to lay back our sound. I wanted to combine the clarity of American music with real power, so we got Mike Robinson in to remix it. On the next album we’d like to use either Rhett Davies or Chris Thomas so we can get as close as we can in terms of clarity and quality of vocal but keeping the rhythm section hard and driving. That’s something I think a lot of bands are lacking”. “Talk Talk’s music is built around stirring, insistent melodies and the sharp songwriting talents of vocalist Mark Hollis. It’s a lush sound, saturated with sweetness and emotion; evocative, ethereal, yet still anchored by a winning pop sensibility” (Jim Reid, Record Mirror, ’82). 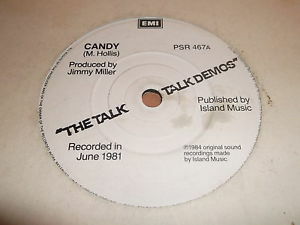 In early ’82, it was mooted that “Candy” would potentially be the debut single from the album, but that idea was shelved and the song never released. Between the two versions, the Demo is perhaps slightly more “emphatic” than the final album version. That in itself gives weight to Hollis’ constant argument that “the first time something is played it is at its finest, and then the minute you try to recreate that, it becomes an imitation of something that was originally better”. That is not to take away from the album version, which is a lot more sophisticated in it’s production. But what it has gained in slickness, it has somewhat lost in rawness. My preference is for the demo version, but you can make your own mind up. 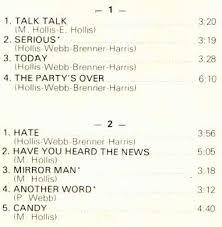 Here is the album version, as usual with those Hollis (not Bacharach as the web would have you believe) lyrics. Enjoy. 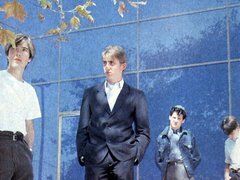 “Candy” – Talk Talk (from the album, “The Party’s Over”, 1982). That I laughed away the idea you’d cheat me? There is a direct correlation between percussion and piano/celeste: the latter are often used as forms of percussion, or a means of providing a double texture to another instrumental sound, anything ranging from woodwind to strings. “Music for String Quartet Piano and Celeste” is the creation of Teenage Fanclub drummer, Francis MacDonald: he has laid down the drumsticks to bring the listener on an altogether more celestial musical journey (every pun intended). MacDonald has put together a beautifully melodic, acoustic instrumental album – uncompromising in it’s sincerity, clear in both sound and direction. The opening track “Playful” gives a light, gentle, almost Summery start to the album; very Michael Nyman with it’s looping piano sequences (a method repeated in “3 4 5”) which give it a somewhat hypnotic sound. “20 Sep” is an altogether more melancholic affair. Dreamy, with some very lovely piano layered over beautifully fragile string segments; it ends with light droplets of piano raining down on the violin; it’s pretty gorgeous. The show stopper for me is “January Waltz” – it doesn’t require words. Just listen, in stillness and quiet, giving it full attention, nothing more. There is something of a Scottish feel about the string arrangements on this album – which comes as no surprise. It gives the music an almost traditional feel, but in a modern classical context. It adds to the warmth and depth of the sound, and I think it’s commendable that MacDonald has managed to cleverly incorporate this subtle indigenous timbre, which serves to distinguish the album from it’s contemporaries. “At a Remove” is a minimalist lament which features some very skilful and honest piano playing: MacDonald has a very light touch on the keys, which gives his pieces a soft, gentle quality. This piece could easily fit into the dream sequence of a ballet or film: for me, it is evocative of childhood memories, or an innocence of a time gone by. Where “Playful” is light and airy, “Ghent” is melancholia. Possibly a sad love song, it is emotionally charged, and it’s depth of feeling is underpinned by exquisite musicianship. One of the most fascinating pieces on the album is the track entitled “Triet for David Hockney”. A short, lively, almost cheeky play of strings and celeste, it gladdens both heart and ears with it’s spritely enthusiasm. “Spirited” I think is the word I’d use. There are eleven tracks in total on this album which was recorded in Glasgow and, which features contributors such as the Cairn String Quartet, and, Craig Swindells & RSNO, amongst others. “Music for String Quartet Piano and Celeste” is a thoughtfully conceived album. It is a melodic journey from happy to sad, from light to shade, featuring some very talented musicianship. It is a wonderful composition, perfectly crafted and elegantly performed. Exquisite.